Inky Dream: Basic Grey , Charisma and Pollycraft Card. I really like the Basic Grey Challenge Blog. The DT work is fabulous and the prizes are sooo great. Their challenge this week is a photo inspiration. I enjoyed the cold, wintery colors with a feminine feel in the photo, so I tried to duplicate that in my card. Charisma- another super fun blog!- wants something new. Easy! I'm always buying and making something new! And Pollycraft wants a winter birthday card. This is my first time entering at Pollycraft. Maybe beginners luck?! Their DT work is also fantastic. 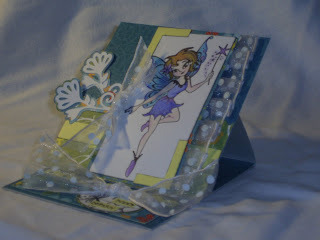 Stunning card Farrah love the fresh colour combo and the ribbon and bows. Thanks for playing along with the Pollycraft challenge. 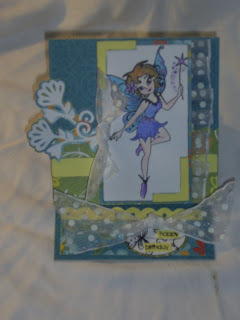 Gorgeous card Farrah, lovely design, gorgeous colours and such an adorable image. Thanks so much for playing along with us at BG.